Part-Whole Concept , the Comparison Concept and/or the Change Concept . The Constant Quantity Concept is applicable when the problems deal with quantities being transferred in or transferred out of one of the two variables concerned. This leaves the other variable with its quantity unchanged, hence we refer to it as the "Constant Quantity Concept". 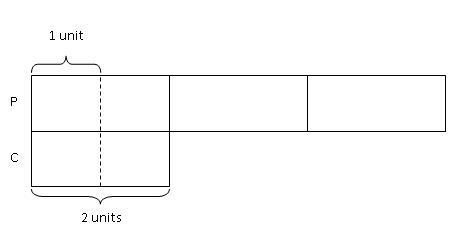 The unique feature in this concept lies in the fact that after the transfer in or transfer out of quantities, the value of the second variable remains unchanged. Pamela had thrice as many hats as Christine. After Pamela gave away 10 hats, she had half as many hats as Christine. How many hats did Christine and Pamela each had at first? 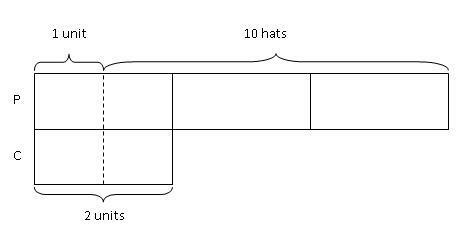 Step 1: Draw 1 box to represent the number of hats Christine had and 3 boxes to represent the number of hats Pamela had at first. Step 2: Since Christine did not receive or give away any hats, the model (1 box) representing her hats remains constant. We also know that after Pamela gave away 10 hats, she had only half the number of hats that Christine had, i.e., Christine would have twice the number of hats that Pamela had. Thus, Christine would have 2 units and Pamela 1 unit. 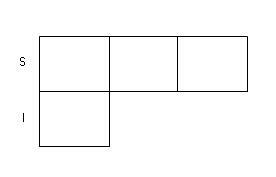 We can then divide the 1 unit that Christine had into 2 equal smaller units and mark out 1 equivalent small unit for Pamela. Step 3: Next, we also know that Pamela had given away 10 hats. 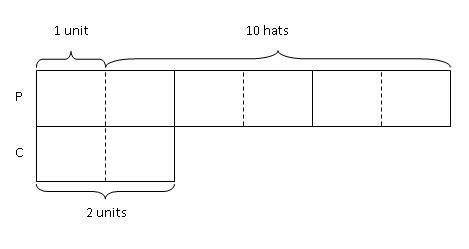 The parts to the right of the 1 small unit in Pamela's model bar must be equal to 10 hats. Step 4: After we had put all the information into the model, we need to check if the unknown units of the model are equal. If not, can we sub-divide them to make them equal. Therefore, Pamela had 12 hats and Christine had 4 hats at first. Sean had thrice as many marbles as Irwyn. After Irwyn bought another 10 marbles, he had twice as many marbles as Sean. How many marbles did they each have at first? Step 1: Draw 1 box to represent the number of marbles Irwyn had and 3 boxes to represent the number of marbles Sean had at first. Step 2: Since Sean did not buy or give away any marbles, the model (3 boxes) representing his marbles remains constant. We also know that after Irwyn bought another 10 marbles, he had twice as many marbles as Sean. Since Sean had 3 units, Irwyn would have twice as many units as Sean, i.e., 6 units. So, we add another 5 boxes to Irwyn's model bar to make it 6 units. Step 3: Next, since Irwyn bought another 10 marbles, these 10 marbles must be represented by the extra 5 units added to his model bar. Therefore, Sean had 6 marbles and Irwyn had 2 marbles at first.